Pop star Sigrid topped the BBC's Sound of 2018 last January on the basis of a solitary four-track EP and a small, if spectacular, set at Glastonbury. The announcement caught the 22-year-old off guard. "I just want to swear a lot, but I know I can't do that on the BBC so I'm trying to hold it in," she said, confessing that she'd never expected the prize to go to a Norwegian performer. Since then, the singer has scored her first top 10 hit with Strangers, sold out London's Brixton Academy, met her first kangaroo and discovered that Helen Mirren was a fan. "She said she liked my music. Apparently she had listened to me before," the star said after meeting the actress on The Graham Norton Show. "She is very, very cool". Despite a hectic touring schedule, Sigrid also managed to finish her debut album - Sucker Punch - which is due out in March. She can't tell us anything about it, though, not even the titles of the new songs her record company played us before this interview. "I'm so sorry!" she cringes. "You'll have to wait." Ahead of the announcement of the Sound of 2019 next week, Sigrid sat down to remember on the best bits of her big year. "Spoiler alert: It's been a good one," she laughs. That was a fascinating moment. When you get a message like that you have no idea how to react, so I went through every emotion you can have. It was thrilling, it was exciting, I was proud, I was humbled, I was scared. I don't know how to explain it. Winning helped my career so much. It's helped with getting TV performances and festivals, and more touring, and more people listening. I'm just really proud of it. We worked really hard on that performance and it was insanely cool, but I was so nervous about the interview. English is my second language so sometimes, when people talk fast, I struggle to understand what they're saying. And because I was nervous, I told everyone on national TV that my dream was to meet a kangaroo! I don't know where I got that from! The kangaroo haunted me for a while. It became this thing in interviews where people would ask me about kangaroos. Then I met a kangaroo! This was in a park in Queensland in Australia. They're very strong animals. You shouldn't mess with kangaroos. I saw a lot of weird animals on that tour - a kangaroo, a koala and a lot of spiders in the woods, on a hike. Were they the dangerous ones? I don't know and I don't want to find out, to be honest. The whole royal thing. Wow. I played for at the Royal Palace in Norway in February when William and Kate visited. I wasn't allowed to tell anyone beforehand because of security - but I chatted to William and Kate for five minutes and they were lovely. Then I got to play for Harry and Meghan at the Royal Variety Performance. You get briefed about how to address them: No swearing! But they were super-chilled. Looking back, I don't know if I was most excited about playing my own set or seeing Beyonce for the first time! Obviously, our show was so much fun - Coachella has been one of my dreams. I remember thinking, "You'd better enjoy this! You'd better not think about anything else other than what you're doing right now". But seeing Beyonce and Destiny's Child was insane. In fact, I didn't know I was a fan of Destiny's Child until they started playing and I knew all the lyrics. I was like, "What?! Where do I know this from?" We did a European tour in November. It was properly the first time I was living on a tour bus and I loved every second of it. I always bring indoor shoes. You know those woollen indoor shoes? What do you call it in English? Slippers! And then tons of water, and Jarlsberg cheese. I have Jarlsberg on my rider. In fact, I had some right before we started our interview. I love it so much. It's good cheese. We had a gig in Switzerland in October, so of course we had to eat Swiss cheese! My tour manager, my backing vocalist and I went out for dinner and we had Raclette and fondue and all those Swiss cheese things. And I had weird dreams and such a big stomach pain for like three days afterwards. I love that this summary of the year is just me talking about cheese and animals. This is why we were in Switzerland. The UNHCR asked us to come and play for Dr Atar [Evan Atar Adaha, a surgeon who runs a remote hospital in South Sudan] who won the Nansen Refugee Award. He's a brilliant person. I learned a lot that night. 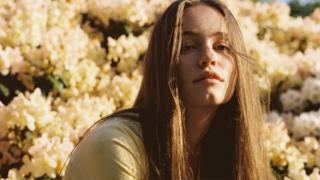 Sigrid's feelings on global politics are laid bare in a new song, Savage In Our Blood, which she played nightly on her European tour. Savage In Our Blood is about all the chaos that's going on around us, and how we pick out what's true and what's not true. It's such a tricky theme to talk about eloquently in a pop song, but that's the whole meaning: Everything feels complex and chaotic when it comes to international politics, or international crises. I'll probably write more about it at some point - I just need to find the right words. That was an intense shoot. We did it in two days in London, from early in the morning 'til 4am. The whole point was for me be myself in my normal outfit, the jeans and the t-shirt, but everything around me is chaotic and surreal - so we had ghosts on rollerskates and I'm setting off pyrotechnics with my choreography. That part was cool. I felt pretty badass. My schedule's pretty bonkers but I got a couple of weeks to work on the album this summer and a couple of weeks this autumn. It's very important for me to come back to the studio because it keeps my focus where the focus should be, and that is on the music. I can't say what's on the album yet - but all the songs are very personal to me, and I'm excited and a tiny bit nervous for people to hear it. It's pretty magical when it feels like you and the audience are playing the show together. It doesn't happen that often but for the whole of my UK tour, people gave so much of themselves. There were people in the audience from the age of seven to 80. I swear I saw a guy in his 80s at our show in Dublin. He was sitting in the balcony with his wife and he was just smiling the whole way through the show. I couldn't stop looking at him, that smile was incredible. We don't know each other; I didn't say "hi" to him afterwards; and I doubt I'll ever see him again - but the fact that he was having a good time, I would call that magic. It meant a lot to me.